Last month I started the practice of recounting what I learned each month. I believe it’s important to see how I’ve grown instead of always focusing on where I need to grow. This practice of looking back to look ahead is helping me be more grateful, more intentional, and just more me. Grab a journal or piece of paper and join in why don’t you. Click on over here to see how others are recounting their Aprils. 1. I still love watching my husband preach/speak. Early in the month Keith and I had the opportunity to spend a weekend at a Hispanic church participating in their missions-focused weekend. I took the above picture Friday night when Keith was speaking (with an interpreter since it was an all hispanic congregation). While he spoke, I was once again so proud that he’s my husband and so grateful that he allows God to use him however he chooses. 2. Being a 1-car family in a family of four is not fun. Recently our son’s car decided it wanted to visit the repair shop and require some not-in-the-budget car repairs. Needless to say, keeping up with four different people’s driving needs with one car is near impossible and daily frustrating. When Keith and I were young married, one car suited our needs just fine. But when the 17-year-old prefers you drop him off down the street from the school, someone’s needs aren’t getting met:) This lesson leads me to #3 . . .
3. Dogs are vital to the stuck-at-home mom. With just one car in the family for now, I get to stay home a lot. While this allows me to work efficiently, it also forces me to deal with cabin fever on a weekly basis. Harvey keeps me sane with his daily walks and companionship. Please note just because you see me chatting with him doesn’t mean I’ve totally lost it: I’ve just become Tom Hanks and made him my Wilson. 4. I’m a fan of hiking, but my knees aren’t. Earlier this month, Keith and I did an 8-mile mountainous hike with some friends. The view from the top was spectacular and worth the hike. However, my knees weren’t convinced. In fact, the last mile down had me interceding for supernatural strength or a piggy-back ride. We are finally moving into a new place this weekend. There was a time I was worried we’d be sleeping in the car. But that worry quickly disappeared as God provided everything we needed at just the right time we needed it. Seven days before our lease was up, we found a place that we love. Then we were able to extend our apartment lease for a few days until the house was available (that’s only because the next renters backed out). Finally, I went to the mailbox one afternoon and discovered a sweet and unbelievably generous gift, one that was a direct answer to prayer. All this occurred one week before becoming “homeless.” The truth is while I think God is working in the nick-of-time, He knows it’s simply right on time. 6. God sees dreams and clears paths as we work. For quite a while I’ve wanted to attend a writing conference. If you’ve never investigated one, they don’t tend to be affordable. A friend told me about one taking place this July in Michigan. I checked into it and then applied for a scholarship. I went back to working on my writing class website and forgot about it. Recently, I got an email saying I’d been approved for one of the scholarships. I was overjoyed and knew that God was clearing a path for me to continue pursuing His purpose for me. Can’t wait to see what else he does as I pursue this dream. Okay, that’s my “learnables” from this month. I wanna hear about yours. 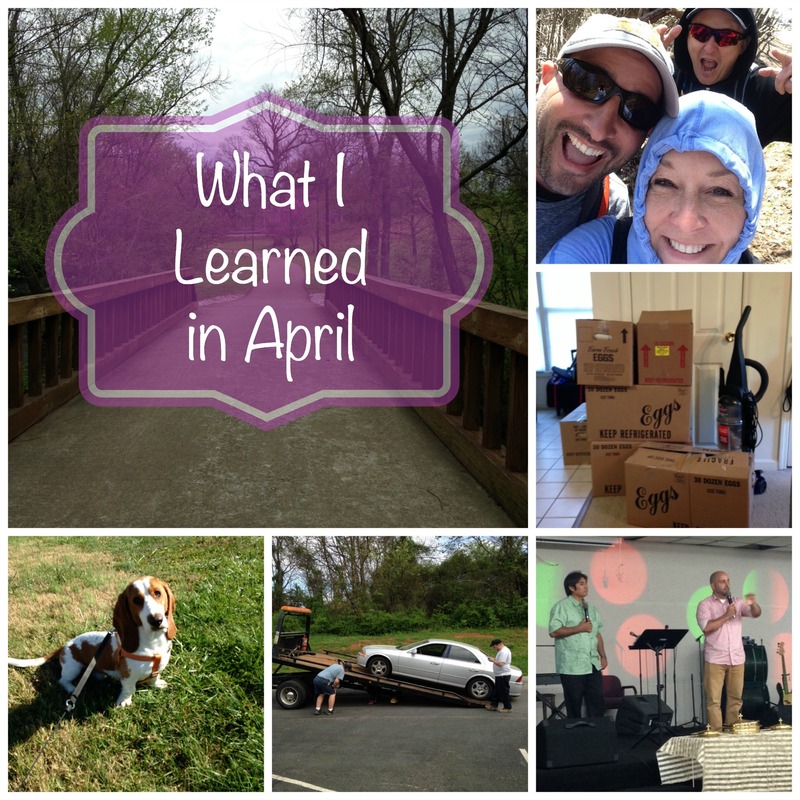 Leave a comment and let me know what you learn in April: the good, the bad, the ugly, or even the funny. This entry was posted in Family Life, Learning, Missions, parenting, Things I Learned and tagged Alicia C. Hall, Alicia Hall, Spiritual growth on April 30, 2015 by aliciachall28. Five months without a smile, giggle, or chuckle. My post-baby body desperately needed a break from the reality of motherhood, so I indulged in a long overdue pedicure. My mind languished under the weight of responsibility, that was until the pedicurist began my pedicure. Suddenly, my not-so-ticklish feet, became tickle hotspots, and before I knew it, deep soul chuckles bubbled out, and tears danced down my cheeks and puddled on my shirt. I could not stop laughing. Apparently, the heaviness of post-partum depression had kidnapped my joy, and my ticklish feet paid its ransom that night. William Frey, a Stanford University Medical School psychiatrist and expert on health and laughter, reports that “the average kindergartner laughs 300 times a day while the average adult averages just 17 laughs a day”1. Obviously, the weight of adulthood and responsibility presses down on the best of us. However, I realized that I lived through most days without a single chuckle. We don’t commit this crime purposefully. Laughter is a welcomed friend, but if we truly understood its benefits, we would beg for chuckle opportunities every day. Proverbs speaks scientific truth when it says, “A cheerful heart is good medicine.”3 Cheerful hearts produce laughter; they learn to look for laughter in any situation in life. This equals health to the body just as Proverbs mentions. Physically, a good laugh can boost immunity, lower stress hormones, decrease pain, relax muscles, and even prevent heart disease.2 In addition, our minds enjoy faster resilience and a lessening of anxiety and fear. Again, the question must be asked, “why is laughter not a vital part of our lives?” There are no good answers for that question except for a meager understanding of laughter itself. Laughter falls into two categories: accidental and forced. Obviously, we encounter accidental laughter at various times in our lives. However, as we grow older we don’t run into giggle-fests very often. What’s the solution? Forced laughter. This phrase seems oxymoronic, but all kidding aside, it is not! It is a scientific fact that the body cannot distinguish between fake and real laughter.4 Both produce the same health benefits. It’s true! Take a moment and laugh out loud – fake it. Truth is, you probably laughed at yourself because you felt so silly. You just experienced both forced and genuine laughter. Even better, you just gave your body a healthy boost. Unfortunately, laughter is one of those don’t-know-what-you-got-until-it’s-gone gifts. And when its really gone, we don’t know how to get it back. There is a solution. It involves getting purposeful and personal with our inner laugh meter. First, track your laughter for a week. How much or how little do you laugh a day? Next, make a goal to laugh once everyday. That means put it on your to do list and make it happen. Now, increase your goal number of laughs per week until you find laughter a daily habit. Finally, take inventory of your hilarity hot-buttons. Ask yourself, what makes me laugh? Pay attention to the moments when you find yourself laughing. What triggered it? Once you have a list, seek out those moments. Be on the offense when it comes to daily filling your laughter tank. We live in a serious society that equates propriety and solemn faces with success. In addition, life often deals a hand that is not a laughing matter. Socrates believed that “the comic and the tragic lie inseparably close, like light and shadow.” He is right because it is laughter that brings light to those dark and shadowy difficult times. Truthfully, we cannot feel angry, stressed, or depressed while laughing. It is scientifically impossible.2 If you don’t want sadness, steal a giggle; need to de-stress, dissolve into laughter, wish to control your anger, chortle and chuckle. Fake or genuine laughter diffuses any negative feelings, and the truth is sometimes life is so bad, you just gotta laugh! This entry was posted in Humor, parenting, setting goals, Spiritual Encouragement, Women's Issues and tagged healthy-living, word gifts on March 27, 2015 by aliciachall28.